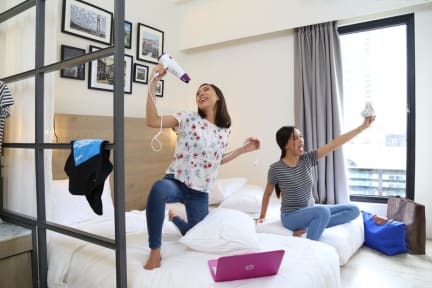 Lub d Makati is the largest hostel in the Philippines and the perfect destination for all type of travelers, especially the millennials who want to find the best place to stay and meet like-minded travelers. Entering the second floor of the lobby zone to chill out, grab a coffee and delicious food at our Grab N Go Bar in the Relaxation Room. A co-working space for the workaholics, and those digital nomads who need a place to work, have a meeting, or making a private Skype call. Our amazing rooftop bar & restaurant with a view of Makati and Manila is ready to blow you away with unforgettable tastes from our top chef and expert mixologist team. We believe the Poblacion district is the place to explore the Filipino’s culture in the neighbourhood, find lots of entertainment & nightlife, great food & beverage choices, shop ‘til you drop, all on the doorstep of Lub d Makati.